to enhance your cooking experience! WILL FOOD STICK TO THE COOKING STONE? Typically, foods will not stick to the cooking stone provided with the oven. However, when preparing delicate or thin foods, such as fish, it is recommended that you use a baking pan or tray for cooking and easy removal. 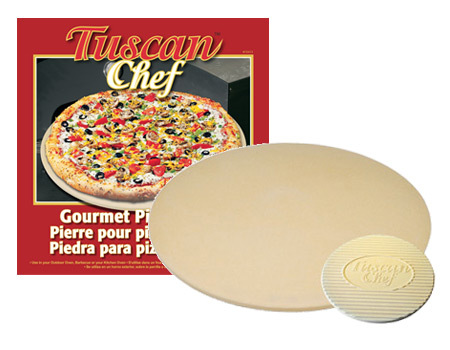 We also recommend using a separate pizza stone (Tuscan Chef #10413) for cooking pizza on the oven stone and upper stainless steel shelf. 13” diameter hi-heat Pizza Stone. In full colour Tuscan Chef Box.